At 7Q Spa Medical Center, we believe healthy skin is beautiful skin. To help our clients achieve the long-lasting, radiant complexion they desire, 7Q Spa offers HydraFacial MD®, a non-invasive, four-step skin care treatment which infuses unhealthy skin with antioxidants, peptides, and hyaluronic acid to smooth fine lines, remove blackheads and whiteheads, shrink pores, and eliminate sun damage with no discomfort and no downtime. 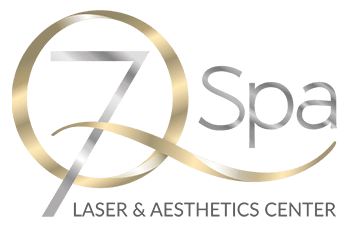 Restore your skin to its healthiest, most beautiful state; contact 7Q Spa today for more information about HydraFacial MD®, the most complete skin care treatment in Glendale. HydraFacial MD® is a non-invasive, multi-step treatment that combines the benefits of hydraderm-abrasion treatment, a chemical peel, automated (painless) extractions, and a specially-formulated serum of antioxidants, hyaluronic acid, and peptides into one simple, 30-minute treatment. Relaxing and reinvigorating, the HydraFacial MD® targets the source of skin imperfections—dry, sun-damaged skin and clogged pores—to achieve natural, long-lasting beauty that emanates from within. Also, because the HydraFacial MD® treatment process is gentle on skin, clients may put on make-up and return to normal activities immediately following the treatment! Using a small “deplaning” tool, a friendly 7Q Spa staff member will open pores and sweep the layers of makeup, environmental debris, and dead cells away from the skin. HydraFacial MD®’s specially-formulated glycolic acid/salicylic acid peel gently removes the outer layer of damaged skin without the burning sensation associated with other treatments. Instead of painful manual extractions, the HydraFacial MD® treatment employs a unique vortex-extraction nozzle that gently pulls oil, dirt, and blackheads from facial pores.